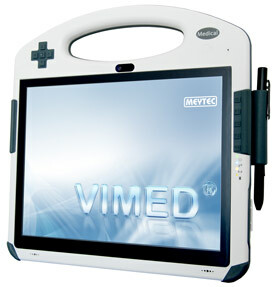 In the VIMED® family the VIMED® ASSISTANT is the smallest portable telemedicine workstation. It is also possible to read the medical or patient data via barcode-scanner or (optionally) with the smart Card-or RFID-reader. The process control can be performed via LCD touch-screen. The system has been specially developed for use in the clinical practice. Their use in the emergency vehicle is also possible. Thanks to the integrated telemedicine module for image viewing, the VIMED® ASSISTANT can be used for telediagnostic, second opinion and emergency support. DICOM-module can be installed optionally. The standard equipment makes it possible to generate, edit and store data. The patient data or X-ray images are finally stored in the electronic patient record (EPR). Various interfaces, e.g. for 2M camera, extra battery (hot swappable) etc.